When Toyota announced that it was building a zero-emissions fuel cell electric vehicle (FCEV) the electric vehicle jihad was horrified. Any threat to their battery-electric plan regardless of its effect on air quality and reducing fuel use is seen as a negative. BEV activists seized on trouble with fueling as the main reason that FCEVs would fail. In the short term, they have been proven right. Inside EVs has detailed the Toyota Mirai’s rollout and this week explained how the hydrogen-fueled EV has been sidelined. Depending upon how you judge the launch of a new vehicle, green cars have had three flops in the past three months. The New 2016 Nissan Leaf launched this past quarter, and its sales are at about a third of the Leaf’s former high point. The new 2016 Tesla Model X launched in late September and by the end of the year only 208 vehicles had been delivered to customers by Tesla. The new Chevy Volt fared a little better with the all-new model’s sales showing an uptick, but still below the model’s historic high. I look to low-emission gasoline fueled vehicles recording historically high MPG averages and the retail price of gasoline tanking bellow the $2 mark for most of North America to stall BEV and FCEV sales in the near term. However, looking to the industry, the near future roll out of gasoline hybrid electrified offerings and plug ins is unprecedented in the sports performance, crossover and sedan segments. Honda was wise in delaying the release of Clarity FCEV. They too point to the need for a viable fueling network. I believe the reality to be a bit more fundamental.When looking to the manufacturing cost of a low volume specialty vehicle, neither Honda or Toyota can justify the cost of the initial factory production run. The future of hydrogen fuel cell generation is a given, but it will take mega-manufacturers to partner up on the manufacturing of fuel cell generators for this technology to $ pencil out! 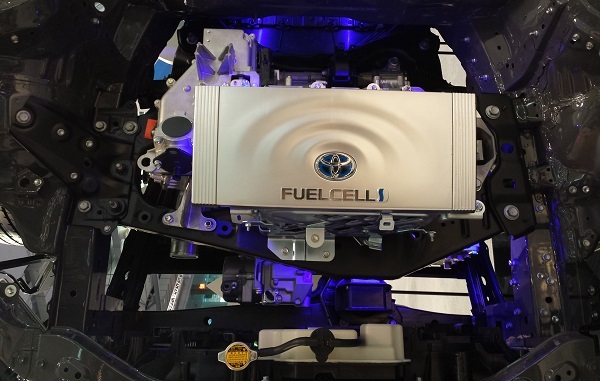 How is the future of hydrogen fuel cell generation a given? Hydrogen fuel cell vehicle was introduced over a decade ago. Manufacturers had plenty of time to build out infrastructure if they were serious about its future. In the meantime, BEV can charge at home, and Tesla has built up an impressive Supercharger and destination charger network. Well this looks like a step backward for the FCV supporters. With the Tesla CPO cars and the Chevy Bolt already on the "short range radar" and plugs everywhere its gonna be an uphill battle for fuel cell cartel to gain any market share.